Etisalat is a mobile operator with the smallest number of subscribers in Egypt (its market share is about 22%). In some areas it has a good GSM coverage, in others the signal is weak. Despite this, Etisalat is the only operator in the country that allows its subscribers to familiarize themselves with the coverage map. Before locating the GSM gateways for termination, make sure that the signal in the area you choose is good. Etisalat prepaid SIM cards are sold everywhere throughout the country, both in the operator’s stores and in the street. The cost of one SIM-card is $1.15 and you immediately get an initial loan of 58 cents on your account. The Etisalat's calls rates are low, which is beneficial for the terminators. The prepaid line is called Ahlan and includes several tariff plans that can be connected after the SIM card activation. Menu El Geneih. There are three options: 30 minutes in the network for $0.03; 60 minutes in the network for $0.06 and 120 minutes within the network for $0.1. Ahlan Pay As You Go. There are several options: Ahlan 15 Pts (one rate for everything - $0.01 per minute for calls, SMS and megabytes); Ahlan Baladna (120 minutes for calls within the network from 12:00 to 03:00 am); Super Yes (the tariff for calls to all networks is $0.1 per minute, the price is $0.58). New Daily Plans. 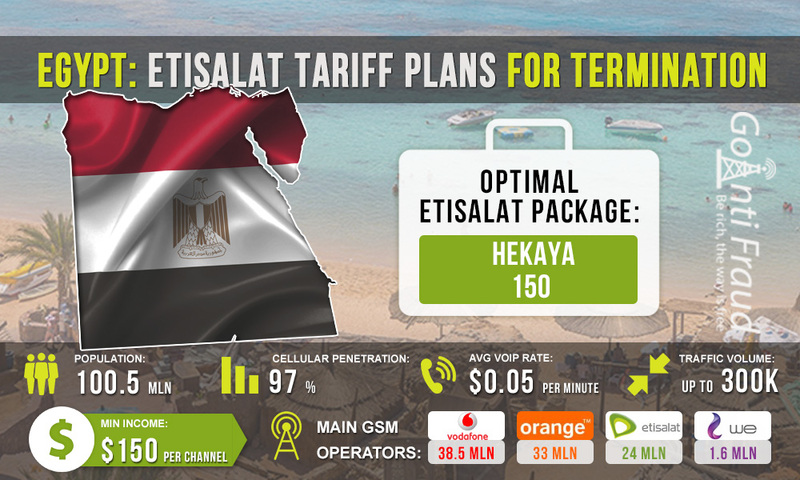 Three packages are available: EGP 0.5 (5 minutes for calls within the network + a fixed cost of $0.01 per minute to other networks); EGP 1 (55 minutes for calls to all networks, price - $0.09); EGP 2.5 (120 minutes for calls to all networks, price - $0.14). Ahlan Ahlan Weekly Plans. The optimal package is Kol 7aga All Week, which is designed for one week. It provides 420 minutes for calls within the network for $0.7. Hekaya 150. 2500 minutes within the network + 250 minutes to other networks; the price is $8.6. Hekaya 200. 4000 minutes within the network + 400 minutes to other networks; the price is $11.5. Hekaya 150 will be the most convenient and profitable solution for SIM cards operation in voip telephony voice gateway. Even if you use only 1000 minutes of the package bonuses, so as not to raise the antifraud systems' suspicion, the cost per minute will be only $0.008. When terminating 1000 minutes a day, you will earn $600 and more (from each GSM channel).